Windows comes with the standard Explorer.exe shell with taskbar, start button, and desktop. Embedded/IoT OEMs looking to make their product look unlike Windows replace Explorer.exe with their own application. To make the shell replacement more manageable, the Shell Launcher features allows you to change the main shell form Explorer.exe to a custom shell executable of your choice. A simple enable / disable capability allows you to switch from custom shell to explorer shell. The feature also allows you to setup different shells for different users. 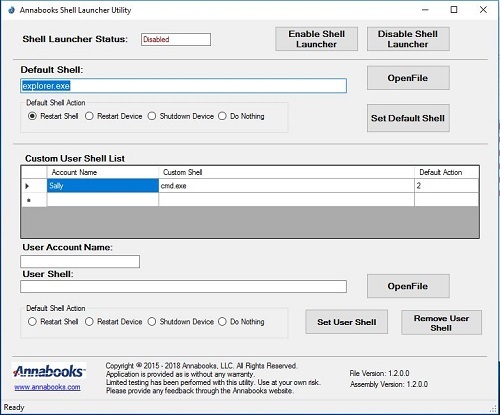 There is only the WMI API set for managing Shell Launcher. The SLUtility and the command line shlmgr.exe were built on the WMI API set to assist with setup and management of Shell Launcher. SLUtiltiy provides a GUI interface with the key functions to setup a default shell and different shell for different users. Shlmgr.exe is the command line version that be called within a batch file to setup Shell Launcher. For example: when you create a customer installer with System Image Manager (SIM), the batch file can be called with a synchronous command. Note: To setup different shells for user accounts, the accounts must already exist. There has been limited testing. The utilities are provided as is without warranty. Feedback is welcome.